LONDON (Reuters) – Oil prices steadied just below two-year highs on Thursday, supported by supply cuts by OPEC and other major exporters including Russia. Benchmark Brent crude oil LCOc1 was unchanged at $63.49 a barrel by 0840 GMT. On Tuesday, Brent reached an intra-day high of $64.65, its highest since June 2015. U.S. light crude CLc1 was steady at $56.81, not too far off this week’s more than two-year high of $57.69 a barrel. Traders said a rally that has pushed up Brent by more than 40 percent since July may have run its course due to increases in U.S. supplies and some indicators of a demand slowdown. “Prices may have reached a short-term peak,” said Fawad Razaqzada, analyst at futures brokerage Forex.com. Prices are still supported by efforts led by the Organization of the Petroleum Exporting Countries and Russia to withhold supplies in order to tighten the market and prop up prices. OPEC will discuss output during a meeting on Nov. 30, and is expected to extend the limits beyond their expiry in March 2018. Despite this, many analysts say the price rally of the past months may have run its course, at least for now. U.S. crude stockpiles C-STK-T-EIA rose 2.2 million barrels in the week to Nov. 3, to 457.14 million barrels, the Energy Information Administration said on Wednesday, contrary to analysts’ expectations for a decrease of 2.9 million barrels. U.S. crude production C-OUT-T-EIA inched up 67,000 barrels per day (bpd) to 9.62 million bpd, the highest on record. Output looks set to rise further. 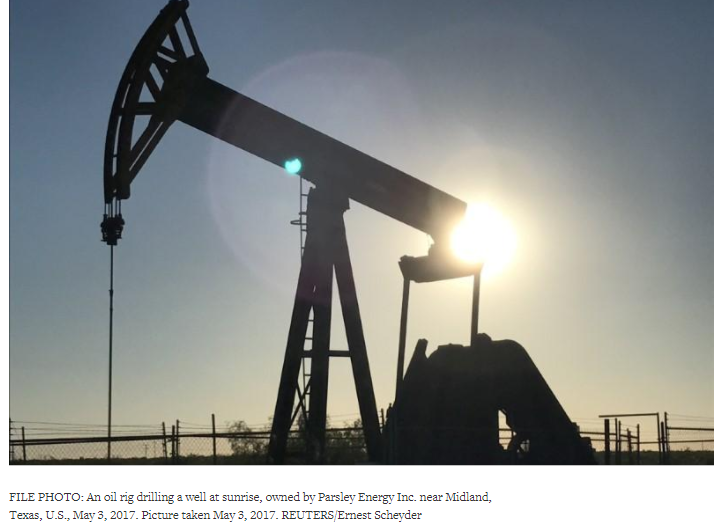 Texas issued 997 oil and gas drilling permits last month, up nearly 17 percent versus the same month a year ago, the state’s energy regulator said on Wednesday. Global fuel consumption remains strong, although the latest figures from top importer China were below expectations. Key for the last weeks of 2017 is whether traders remain confident about their huge bets on further price rises, or if they sell out, satisfied with recent strong gains. “It doesn’t matter how bullish the fundamentals are … when an asset goes vertical there is always room for a pullback and consolidation of recent price moves,” said Greg McKenna, chief market strategist at brokerage AxiTrader.